Cranio e cervello di un idrocefalo di 19 anni. Description : 285�6 p., [3 l.] pl. ; ill.: 2 phot., 2 lith. ; 24 cm. 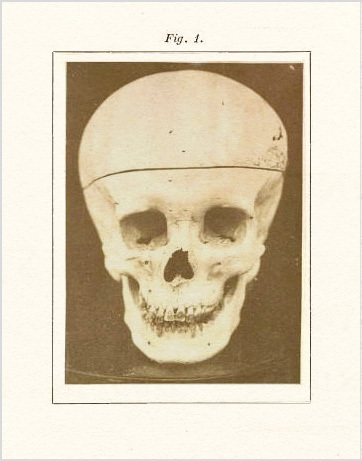 Photograph : 2 albumens, mounted on printed leaf, front and side views of a skull. 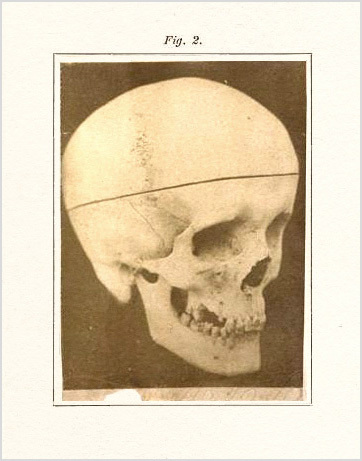 Subject : Cranium — Hydrocephalus. Author caption: Pel Prof. A. Tamburini. Medical degree, University of Bologna, 1871. Tamburini (1877) succeeded founder Carlo Livi as director of the lunatic asylum of Reggio-Emilia. Director, Psychiatric clinic, University of Modena. Chair of Psychiatry, University of Pavia. Co-Editor: Rivista sperimentale di freniatria. Co-founder (1896) of the journal "Rivista di patologia nervosa e mentale." English transl. : American journal of insanity, vol. xxxvii, p. 397�2. Photo captions: Tav. XII ; Fig. 1., Fig. 2. Tamburini is remembered more for a lifetime of incremental structural contributions than for anything truly groundbreaking. As director of Regio-Emilia he proposed guidelines for assessing and documenting asylum inmates which included instrumentation with a craniomenter and dynamometer, writing, "The careful and conscientious study of the entire criminal population enclosed therein, conducted without prejudice and with precision and uniformity of method, would certainly furnish, in a few years, an immense amount of material that would serve to solve a great many problems pertaining to penal and criminal disciplines" (Tamburini & Giulio Benelli, 1885, "L'antropologia nelle carceri," Rivista di Discipline Carcerarie 15 (4): 136-147). He made contributions to Lombroso's studies of criminal behavior and collaborated with his friend Luigi Luciani (1840-1890), providing him with a laboratory at Reggio-Emilia for conducting research on the physiology of the cerebellum.